I managed to nab myself a couple entry tickets to the Pure Exhibition that took place two Sundays ago, an exhibition predominately for buyers. There was promise of hundreds of leading premium womenswear labels showcasing their new collections as well as up-and-coming labels to watch out for, trend presentations and catwalk shows – I couldn’t wait. Waking up after 3 hours sleep (there is a key word in ‘Ronnie Scotts Late Night Show’ that stands true) was not easy but my excitement kept me going and the bright idea of cucumber on my eyes for 10 minutes was a refreshing thought. Anyway, me and my number one fan, friend and photographer for the day met up, entered the grand Kensington Olympia and for as far as the eye could see, there were indeed, hundreds of labels waiting to be explored, my poor eyeballs were all over the place. So tempted to get on that bonnet! First stop, coffee! Then off we skipped to the trends presentation which was presented by fashion commentator, Khabi Mirza and Asos womenswear buyer, Jo Hunt. 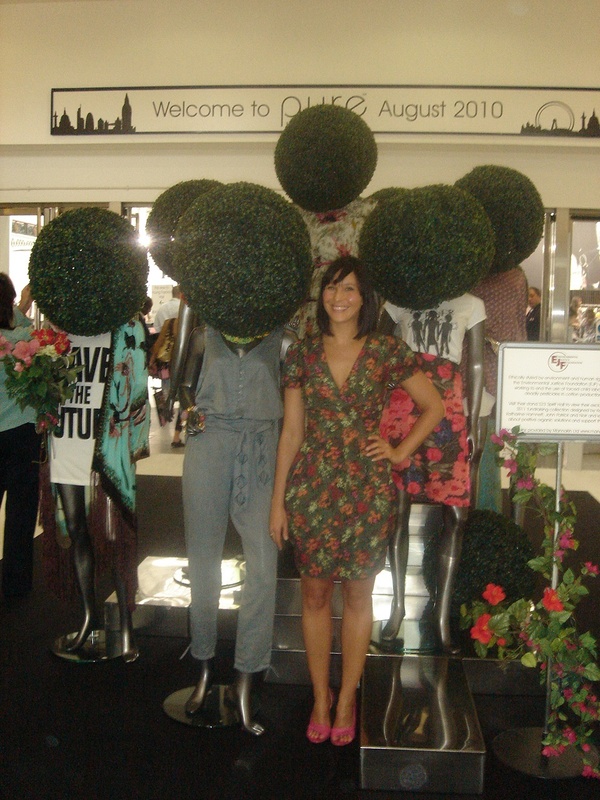 They worked their way through high street trends for a/w 2010, providing invaluable tips on how to make these trends work. The Military Look – this recent trend is not going anywhere and will be taking on a slightly different look for a/w, with military jackets taking on a more Scandinavian influence, oversized tops and skinny army green trousers. This trend will even continue into summer 2011, with military shorts in more interesting fabrics. Complete this look with a tousled scarf, giving off a global traveller vibe. Key colours here are army green followed shortly by navy. Going hand in hand with the above military look is aviation interpretation of the trend. This look is all about a sleek look with slim cuts with darker hues and dark-brown leather jackets. If it has faux fur, lambs wool or sheepskin on the collar – even better! Country Sloan Trend – The term sloan refers to a stereotype in the UK of young, upper class or upper-middle-class women or men. Initially the term “Sloane Ranger” was used mostly in reference to women, a particular archetype being Princess Diana. For this look think of tweed jackets, skinny jeans or jeggins, cable knit jerseys and brogues. Look for contrasting colours under the collar and lapels of the jackets to make your outfit look young and fresh. Khabi Mirza giving us the lowdown on the Country Sloane trend. This trend is all about using heritage fabrics and patterns with a modern interpretation. Other items included in this look are quilted jackets, prints on slouchy jerseys, printed and plain corduroy, equestrian details such as chains and buckles. Capes are set to be huge over a/w so grab yourself a navy, camel or khaki one to take you through the seasonal colour changes. I have a few more trends to update you on but it’s way past my bed time and a girl needs to get her beauty sleep. Pop back in soon to see what trends will be hitting the streets in full swing very soon – hopefully not too soon, I don’t want to wish the summer away, but at least we have some fab items to look forward to.